"Dip deep with deep-dish flavor! Mix your favorite pizza toppings and McCormick® Thick & Zesty Spaghetti Sauce Mix for an appetizer that was made for game day. Serve with sliced garlic bread or toasted baguette and soak up every drop. That's how you play to win." Preheat oven to 375 degrees F. Prepare sauce as directed on package. Cool slightly. Mix ricotta cheese, egg, 1 cup of the mozzarella cheese and Parmesan cheese in large bowl. Spread in 9-inch round cake pan sprayed with no stick cooking spray. Top with prepared Spaghetti Sauce. 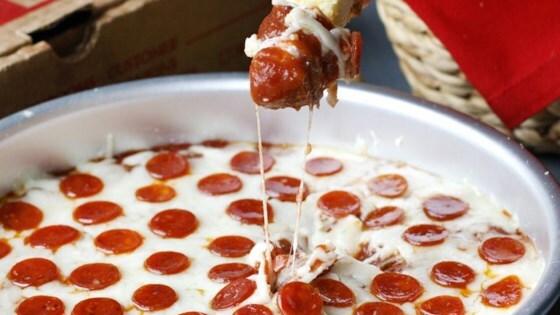 Sprinkle with remaining 1 cup mozzarella cheese and pepperoni. Bake 20 minutes or until heated through. Serve with sliced garlic bread, breadsticks or toasted baguette slices. I made this Saturday and my Husband loved it I made a couple of changes I sauteed fresh garlic and basil and used my own pizza sauce I will definitely be making this again.